Egypt was ruled for last 30 years by a corrupt Dictator Hosni Mubarak who was backed by US, Israel and Western Countries. Hosni Mubarak was having billion of Dollars and he lived a very rich life. Last year Egypt seen a revolution in result of which Hosni Mubarak lost his 30 year rule on Egypt and now in 2012 Egypt got a simple person Mohammed Morsi as President in result of elections. Mohammed Morsi lives a very simple life and even after becoming President he has continued to do so. for example he has refused to take President' Salary. He will not live in Presidential palace instead in his house. His wife has refused to be called as first lady. Motorcade of Mohammed Morsi is also very small unlike Mubarak. 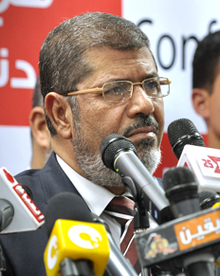 Experts says if Mohammed Morsi worked well Egypt can become one of the most progressing country in few years. It will also be interesting to see how he cops with Egyptian army who ruled country for decades.